In 2005, Pei Wei Asian Diner realized that their location’s cost for locksmith call outs where growing. This cost was absorbed by the corporation. This cost began to reach an expense that resulted in the facilities team to look into the reasons for the additional expense. Their research revealed that the restaurants where experiencing the call outs when the general manager realized that a key was missing; which was usually later in the evening, changing out the cores when they just needed an additional key for a new key holders, and re-coring the location due to an unknown quantity of keys for the location. These three factors were a driving force in the increased cost that Pei Wei faced with their key control, and thus they began their search for a solution to reduce their cost. During Pei Wei’s research, they came to the realization that a standard key control policy that could be implemented across their restaurants would provide much needed direction to the General Managers of the restaurant locations. This single key control solution led them to InstaKey Security Systems. 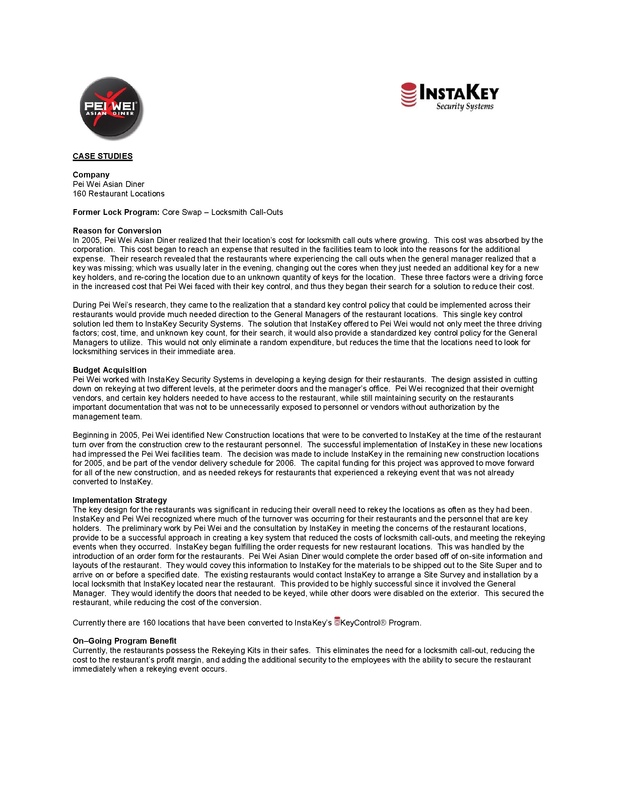 The solution that InstaKey offered to Pei Wei would not only meet the three driving factors; cost, time, and unknown key count, for their search, it would also provide a standardized key control policy for the General Managers to utilize. This would not only eliminate a random expenditure, but reduces the time that the locations need to look for locksmithing services in their immediate area.